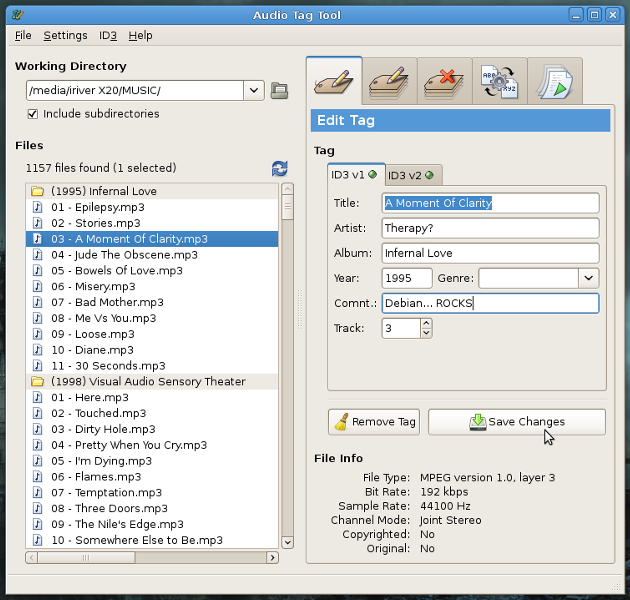 Audio Tag Tool is a program to manage the tags in MP3 and Ogg Vorbis files.It can be used to edit individual tags, or to easily tag or rename hundreds of files at once, in any desired format. It can also create playlists. I am personaly using Easytag which is a really powerfully piece of software. Is there any advantage using tagtool (compare with Easytag)? I love this program, with one huge exception. I use puddletag. Its almost the Linux equivalent to MP3tag. IMO – I ran through a bunch of tag/meta data edting software last summer (including EasyTag, TagTool, Picard, several music players that offered tag editing, and more). TagTool wasn’t up to the job compared to EasyTag. TagTool is okay if you need to just tag a few files, but if you are working on doing any serious metadata editing, I’d highly recommend EasyTag – it takes a bit to learn, but once you uncover the power, it really makes the editing process a lot easier. I’m a big fan of EasyTag. Seems to be the best tagger so far. Also check out the tagging capabilities of gmusicbrowser. @George they are. You can add any field you want to the Tag Panel. Extended tags can be viewed/edited by using the Edit>Extended Tags menu. All I wanted to do was rename my ogg files according to the meta-data. Despite being a programmer even I couldn’t work out the bizzare interface of ‘easy’-tag and instead did it in two seconds using tagtool. Total and utter fail if tags contain UTF-8 (or tagtool think it does). Tagtool just messed up my collection. It seems to do everything I want it to do, and I appreciate the minimalism. But I don’t see an option to add or change cover art. Tag editors in Linux usually treat this as a superfluous option for some reason.